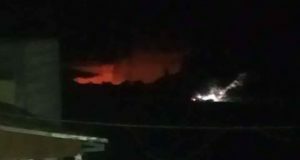 Yesterday night, at 21:40, an announcement was made over the mosque loudspeaker in Deir Istiya that settlers were planning an attack. Villagers were warned to stay wake and on watch for possible violence. At 22:45 IWPS began a night watch in Deir Istiya and learned that the Israeli District Coordination Officer had contacted Salfit municipality who in turn communicated to Hares, Kifl Hares and Deir Istiya’s councils that settlers were surrounding villages and to be on the lookout for possible attacks targeting the mosques from the illegal settlements of Yakir, Ariel and Revava. The men of Deir Istiya, Hares and Kifl Hares stayed up all night on the streets keeping watch over the village. 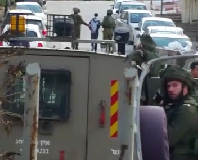 At 1:00, approximately 30 Israeli soldiers were seen along with two army vehicles on the main road outside of Hares. At 2:00 the soldiers entered the village. The 30 soldiers entered a house premises on foot and asked a 15 year-old for his 21 year-old brother by name. The brother of the young man stated the person they were looking for is a university student and not in the house. The military entered the home and forced the 10 members of the household to sit in one of the downstairs rooms as the soldiers searched the house four times. When the soldiers did not find the 21 year-old student they were looking for, they grabbed the 15 year-old brother who had answered their questions at the door. One soldier began to bind the boy’s hands and blindfold him but another stopped him, stating they would continue when they were out of sight of the family. The soldiers stated to the family that their son “had caused some problems” and they would return him in two hours after questioning. The soldiers left the family a handwritten note for the 21 year-old older brother to meet Captain Afiq at the Qalqiliya checkpoint at 9:00 on 9 May. Captain Afiq came to the door of another house in Hares ordering the family to “count your sons” and then referencing one by name whom he wanted to see outside for “five minutes”. The 16 year-old was then blindfolded and handcuffed from behind. The arrested youth’s 20 year-old brother is currently serving a total of nine months in Megiddo prison (three months for a stone throwing charge, plus six additional months for it being his second offense). The entire 10 person household, the youngest being 12 years-old, were forced to stay in one room for two hours. The soldiers also broke the front gate and damaged the door by forcing it open. 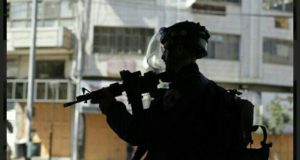 Simultaneously, a 23 year-old was taken by the Israeli military for the second time. At 1:00 the mother of the household heard a noise, opened her window and saw an Israeli soldier jumping over the fence that surrounds her yard. Around 30 soldiers came into the family courtyard, some entered the house. The family of 11, with 9 children and a father with a neurological disorder who frequently loses consciousness, were pushed into one room. The soldiers had a slip of paper with one of the son’s name printed on it; the young man was woken up and brought to the next room where they would not let him retrieve his identification card nor would they allow him to dress. The soldiers blindfolded him and tied his hands behind his back while his mother attempted to give him clothing. This young man, who has previously been in prison for a year, was told that he was “again making problems” and will get a five year sentence. Between 2:30 and 3:00 the army entered two separate houses in the village of Deir Istiya. The soldiers were observed entering from the illegal settlement of Yakir through the hillside olive groves. The soldiers took two minors outside and started questioning them about who was throwing stones and what the announcements from the mosque were. In one case the soldiers took the entire family outside and then searched their house while they were not present and then left. No arrests were made in Deir Istiya that night. Although a 22 year-old and an 18-year old were arrested in the village of Kifl Hares at 2:30 AM.